Shortly after Michael Gove took the reins of education policy, he published a white paper entitled The Importance of Teaching, which made improvements in the teaching of maths and science national strategic priorities. Today we get some measure of how that strategy is working out. Up to 100,000 pupils in England and Wales face lessons in the key subjects of maths and physics by teachers with no qualifications in the subjects. Up to 30% of maths places on PGCE teacher training courses due to start in September remain unfilled, potentially leaving schools 700 recruits short next year. 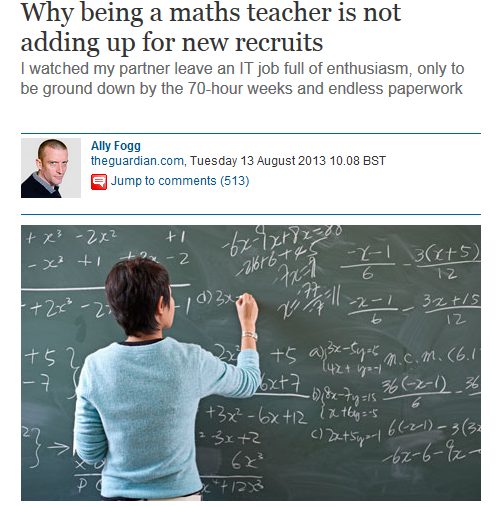 There is a similar problem with physics, where courses have attracted 386 fewer recruits than in 2012. The academic researchers behind the findings say that the government became complacent after 2010, believing that falling school rolls and the lack of alternative career options for young graduates would ensure sufficient supply of qualified candidates. Professor John Howson of Oxford Brookes University said: "We've now had successive years when public sector wages have been held down, and regular stories about the problems facing the profession. No wonder graduates in the Stem (science, technology, engineering and maths) subjects are accepting jobs elsewhere. That was always the risk." I wouldn't dispute any of that. However, personal experience suggests it might not be the entire reason for the problem. About five years ago, my partner was returning to work after the birth of our second child and rather than finding a new job in software analysis and coding, she made a decision to retrain as a maths teacher. It was, she will now tell you, the worst decision she ever made. Of all the reasons she had for the career switch, the one that now looks the most laughable is that the hours would be more amenable to being a working parent. She would share school hours, be blessed with long holidays. Yes, there would be marking and lesson plans to do, but they could be squeezed into the hours after our own kids go to bed. She may as well have hoped that Rumpelstiltskin would arrive in the night to weave her pile of year 8 homework into threads of gold. The reality of her teaching experience was three years of unbridled hell. She would regularly work until 2 or 3am, and rise again between 6 and 7am. I would wake up in the morning, unsure whether or not she had been to bed at all. At least one if not two days of the weekend would be lost to schoolwork – even the famed teachers' holidays would be used to get a head start on plans for the next term. In her time as a teacher, my partner's average working week was 70 to 80 hours. That is immensely demanding for anyone, but for someone who is also trying to share care of a young family, it is almost unsustainable. The hours spent in the classroom were often stressful and demanding, trying to keep 30 unruly teenagers interested in quadratic equations in the knowledge that if the attention and co-operation of just one kid is lost for a few moments, the entire situation could collapse like a house of cards. Trying to do so while under enormous external stress and with persistent sleep deprivation is a recipe for a breakdown. Estimates vary, but it is likely that as many as 50% of those who enter teaching will drop out within five years – 30% within the first year. This is a horrific attrition rate. On top of that, 2.7m teaching days are lost to illness each year, and in half of those stress is either the diagnosis or a significant contributory cause. About 2,500 teachers take early retirement on health grounds every year. The experience of my partner and her friends and colleagues is that the actual job of teaching is not the problem. The real burden is the paperwork: the individual lesson plans that have to be prepared and filed, the assorted attainment checkbox forms; all the bits of paper introduced by successive education secretaries to encourage teachers to work harder and more efficiently have had the precise opposite effect. With a degree in maths and an MSc in IT, my partner did the sensible thing and returned to programming computers. She has never been happier. I suspect the crisis in Stem teaching is greatest because other teachers have similar options. Who would be a teacher? Often only those with no other options. I'm not surprised there is a shortage of maths teachers. I'm astonished there are any left at all.